Do you use a packing list before you go out? You know how it goes; You have a beautiful new DJI Phantom 4 and a couple of batteries, you’re off to the park, to the open fields, you start unpacking your kit and you realise, s*%# I forgot my lightning cable! Trust me, I know the feeling, it has happened to me in the past, and it will happen to every single drone operator out there. If they say it has not happened yet, it will someday. Luckily I learned from my mistake. Nowadays I never have to worry about a missing cable on location, because this error prompted me to create a checklist that minimizes the risk of forgetting equipment before I get out of the door. In this blog post, I will give you the secret to my pre-flight checklist starting at home/the office. I will also give this checklist to you so you can print and use them for all your pre-flight prep. Wednesday we’ll dive into the second part of the pre-flight setup which is a pre-flight checklist on location. We’ll go into the specifics of setting up on-site following a checklist and getting off the ground quickly. But that’s for later! Why checklists are a smart idea. Making sure you have everything you need out on location. Iterating and developing your checklist continuously. Download my very own checklist that I use with my drones. I’m going to use my personal Phantom 3 Professional as an example. Most people will have one of these two drones; luckily this can be applied to any drone of any manufacturer. 1. Why checklists are a smart idea. Professionals use checklists in all industries. For drone operators that are looking to go professional, following a pre-flight checklist is a must, both for safety and it will make sure you can deliver to your client. You don’t want to be the guy having to cancel your flight because you forgot an item on set. That equals no payment, no returning client and bad word of mouth press. 2. Making sure you have everything you need out on location. To do this, I’m going to break down everything I take with me out on location when shooting (If you are wondering how I take all of this with me, check out my post on the backpack I use here). Most of these items will look familiar to you; some might not. I will go over some of them quickly. Polar Pro Phantom 3 Filter set: These are filters that can be put on your Phantom 3/4 camera to help cut down the amount of light coming into the camera. Using filters will allow you to keep the shutter speed lower which will make for a smoother more cinematic image. The general rule is your shutter speed should be double the frame rate. So 25fps = 1/50s shutter speed. 50fps = 1/100s shutter speed. Pocket blower: This is something every camera man, photographer or aerial cinematographer should have in his bag. A simple air blower that works anywhere, it is great for getting dust off a sensor, lenses or equipment without leaving any fingerprints. Leatherman Wave: Probably one of the best purchases I have ever made. The Leatherman is known by many; it’s a multi-tool that has everything in it from pliers to knives to screwdrivers. It attaches to a belt and is great to have with you anywhere, anytime. Checklist: Aside from the checklist we are creating in this blog post, I have two other checklists; one is my pre-flight checklist, and one is my post-flight checklist. Great tools to make sure you fly safely & securely. 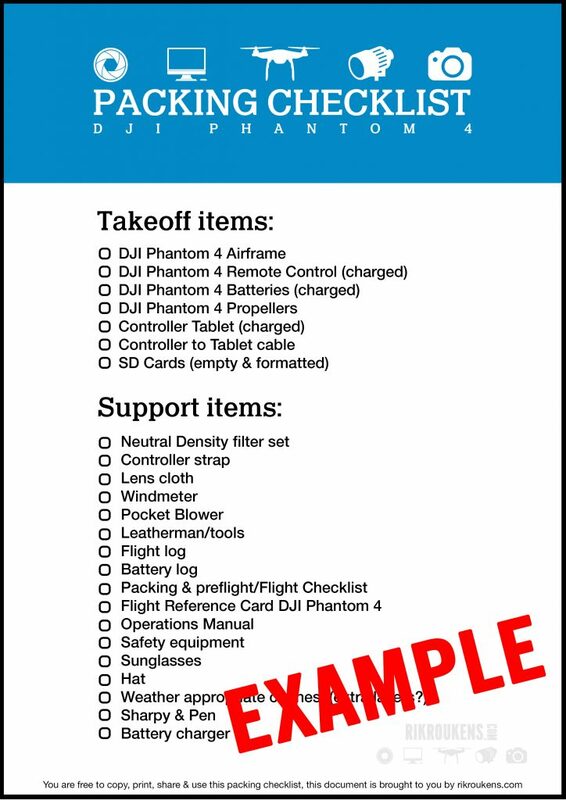 Flight Reference Card DJI Phantom 3 Professional: Similar to the checklists, I have created an FRC for the DJI Phantom 3 Professional. The FRC allows me to quickly see certain information that I need before or during a flight in case of an emergency. Many pilots do not use these simply because they do not know about them. Operations Manual: This is the most important document of all. The operations manual is your Bible; it serves to guide you during all your operations, whether it is Training, Recreational or for commercial flight. **Safety Equipment: **These include hi-vis vests, cones, dry powder fire extinguisher, cordon tape and UAV operation signs. It is paramount for you to understand that all these documents are highly recommended for any drone/UAV pilot and an absolute must for commercial pilots, e.g. in the United Kingdom you are not allowed to fly commercially without these. Soon, I will go in-depth into all these documents, explain how to use them and will give you samples you can use yourself. 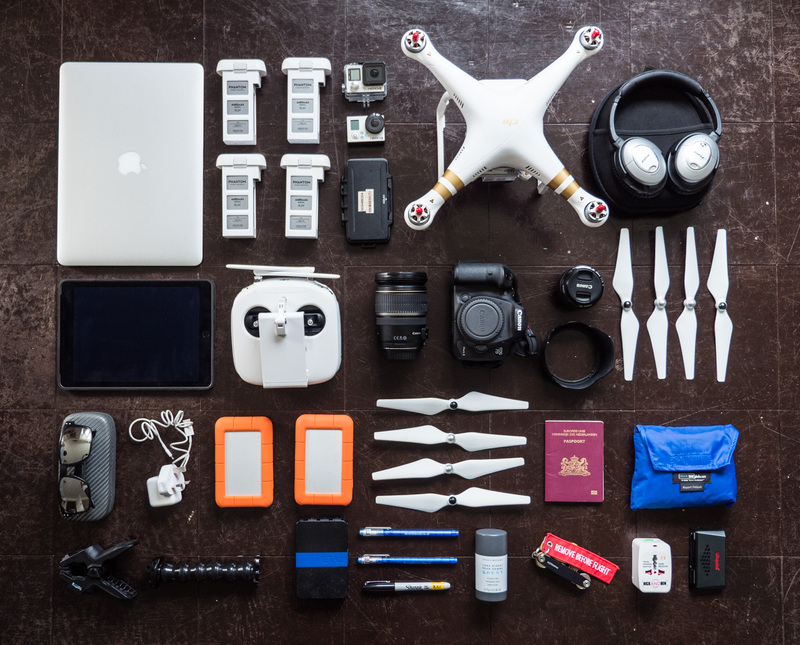 The key with a checklist is to include everything you need for your flight and everything that is in your bag. If it is not on your checklist but you are adding it to your standard list, then update your checklist. Keep iterating this until you have found the perfect checklist. Then iterate again. I can guarantee you that by using a checklist, you will save yourself from a classic one day; Nooooo forgot my microSD! 4. 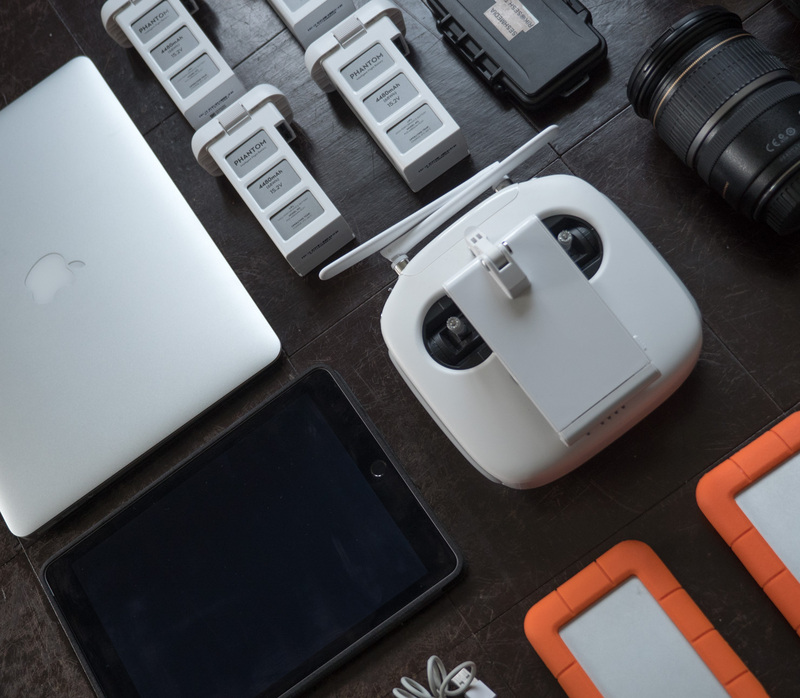 Download the checklist I use for my drones. What’s easier than downloading a ready-made checklist for you to use? Exactly, nothing! That’s why I’m giving you the checklist that I use on a day to day basis in the field, both for training & commercially. Print it out, laminate it and keep it in your bag, it’s a simple but great tool to have. Good news! I’ve created a packing checklist for most of the popular drones! Can’t find yours? Let me know and I’ll create one for you! Hopefully, you see that having a checklist inside your bag is a good thing, not a bad thing! It is so helpful to make sure you have everything you need. If nothing else, using a checklist will free up your head to start thinking creatively about your flight. Checklists are also ideal to minimise risks as they work as a safety net for human error. Later this week we’ll dive into the more interesting part of checklists, the pre-flight checklist, We’ll go over my pre-flight procedure on location and see how I can quickly and safely set-up. As always, if you have questions or suggestions, let me know in the comments below! Do you have a pre-flight procedure?